With a number of trails on this remote island paradise in Maine, Isle au Haute (pronounced “Isle a Ho”) keeps hikers busy with great views. See the beautiful coastline, hike through marshes alive with life and enjoy the freshwater lake with mountain backdrops. 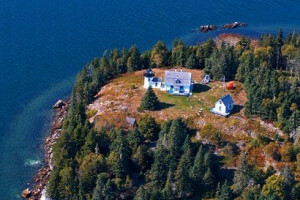 You can only reach the island by a mail boat from Stonington, Maine, and the best season to come is from late April or early May through mid-November. This moderate hike takes you near the rocky shore and provides an open area for picnicking. Explore the island’s treats on this 2.9-mile trail. Trailhead: From Stonington, Maine, take the mail boat to Duck Harbor. The trail begins across the inlet from the boat landing. You’ll see the sign. This trail takes you through the Maine woods on the island, with some rocky coast highlights as well. You can walk all the way from Duck Harbor to the town landing in the northern section of Isle au Haut. Trailhead: From Stonington, Maine, you take the mail boat ferry service to Duck Harbor. The trail begins across the inlet from the boat landing. You’ll see signs. This is the most strenuous hike you’ll find on Isle au Haut. But the panoramic views are well worth the effort. On top of Duck Harbor Mountain the views of the island are magnificent. Trailhead: Once you reach Duck Harbor on the mail boat from Stonington, Maine, you will find the trail begins a bit south of Duck Harbor off Western Head Road. Watch for the sign. This coastal trail is great for adventure. If you are walking here at low tide, you can cross to Western Ear, another small rocky island. From Western Head, you get wonderful views. Trailhead: From Stonington, Maine, you take the mail boat to Duck Harbor. The trail begins off the Western Head Road, south of Duck Harbor. Just watch for the sign. If you love to view the crashing surf and to see panoramic views of the majestic granite cliffs, this trail is for you. You can reach Squeaker Cove and may spot the elusive mink along the way. Trailhead: From Stonington, Maine, you take the mail boat service to Duck Harbor. The trail begins at the end of Western Head Road. You’ll see a sign for the trail. Although you won’t get coastal views along this trail, you will enjoy the forest setting and a beautiful rock garden. Hiking through a cedar swamp is also a real treat. This spur trail gives you access to other trails around the island. Trailhead: Take the mail boat from Stonington, Maine to Duck Harbor. The trail begins off the Goat Trail above Barred Harbor. To reach this trail, you will first need to get there by walking 3 miles along the island loop road, but it’s worth the extra effort. The views (as well as the lack of people) are well worth it. 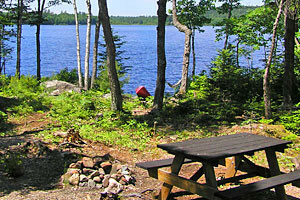 Get some great views of the mile-long pond on the island. Trailhead: Once reaching Isle au Haut on the mail boat from Stonington, you’ll find the trail north along the dirt loop road around the island. A sign marks it. Find wildflowers abloom along Bowditch Trail, including the opportunity to hike along the spine of Isle au Haut. 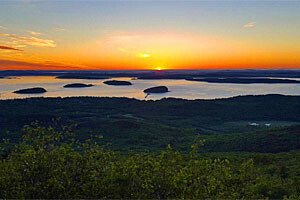 You will climb to the summit of Bowditch Mountain, the highest peak on this lovely isle. Trailhead: This trail intersects with the Duck Harbor Trail north of the loop road and also with the Long Pond loop trail. Signs are posted. This trail acts as a connector to others for long day hikes. The highlight of this trek is the natural plant growth and its nearness to the lovely Merchant Brook. Be ready for a wet path, as the brook often runs down the trail itself. Trailhead: Nat Merchant Trail intersects with the loop road around the island, just above Merchant Cove. It is marked with a sign.